Just like Nike's KD 11, most wearers declare that the Nike Zoom KDX feels great on foot and are extremely comfortable to wear. Many users appreciate the shoe’s Flyknit upper. They say it’s lightweight, breathable, and easy to break in. The shoe’s traction works pretty well on clean indoor and even outdoor courts, most testers observe. Wide-footers can go true to size, nearly all reviewers note. A good number of purchasers are satisfied with the shoe’s cushioning. They mention that it provides the right amount of court feel, responsiveness, and impact protection. Several players comment that the shoes have a well-balanced ride with a smooth heel-to-toe transition. The Nike KD10 is a lot easier to put on than its previous iteration, a lot of testers notice. These basketball shoes from Nike are very supportive say a lot of wearers. The shoe fits like a glove according to a number of users. Most testers are disappointed with how the KD10’s traction performs. They are saying it’s inconsistent and they find themselves wiping a lot more often than they used to. Nearly all reviewers notice that the cushioning feels stiff and takes a while to break in. Users report of having the same experience with Nike Basketball's 16th LeBron shoes. The KDX runs long, almost all testers declare. A few purchasers report that these Nike low-top basketball shoes fit narrow and are uncomfortable to wear. The shoe’s traction is soft and wears down easily, most testers note. They assert that outdoor play is not recommended. A good number of testers observe that the Nike Zoom KDX lacks lateral containment. 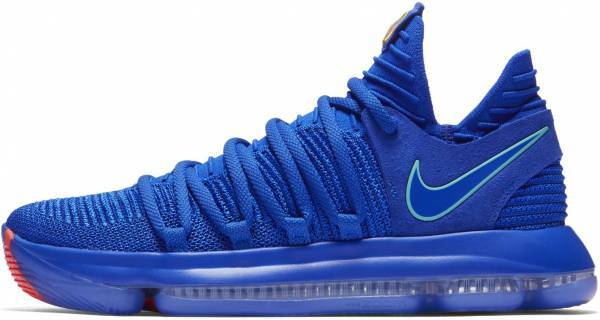 The Nike Zoom KDX is very similar to its predecessor the Nike KD9. However, Nike made some minor tweaks that affected the shoe’s on-court performance in a major way. The full-length Zoom Air and Flyknit are well implemented, but the traction and overall containment are simply average. The KD10 just falls short of being a groundbreaking solid hoop shoe. But it gets the job done. It looks amazing, but it suffered in a few areas due to the bold new design. it’s an awesome sneaker for the right price nonetheless. There were such minor changes to my favorite shoe of 2016, but those changes affected the play in a major way. Always ready to compete and play, the Nike Zoom KDX is designed with ultra-responsive cushioning and on-demand support that fits Durant’s versatile playing style. The zoned Flyknit upper delivers stretch and breathability while the Zoom Air cushioning allows energy return for ultra-responsiveness. The tenth iteration of Kevin Durant’s shoe is as responsive and versatile as he is. Cushion. Featuring a visible full-length Zoom Air unit, the KD10’s low-profile cushioning provides ultimate responsiveness and absorbs impact on every takeoff and landing. The Nike Zoom Air unit absorbs impact energy while still allowing your foot to bend naturally. It’s lighter in the forefoot for better control and denser in the heel for better impact protection. Traction. The Nike Zoom KD10 has a durable rubber outsole with a radial traction pattern that delivers multidirectional grip all game long. Length and Width. Normal and narrow-footers are advised to go down half a size since the Nike KDX reportedly runs long. Wide-footers can stay true to size. Lockdown. The Nike Zoom KDX has a dynamic lacing system that moves with your foot and a sock-like construction that provides a customizable fit. Oversized laces wrap the medial and lateral sides of the foot; keeping it secure and providing comfortable support. This unique lacing system delivers a locked-down fit where and when you need it. A lightweight Flyknit upper delivers zonal stretch and breathable comfort. The zoned Flyknit fabric features areas of breathability, stretch, and support for superior comfort and a sock-like feel. Sharing a similar silhouette with the Nike KD9 and KD9 Elite, the tenth version of Durant’s signature shoe combines a low-cut profile with his favorite upper material. Adding Flyknit is a notable design shift in the KD line’s evolution. Pull tabs on the tongue and heel allow easy on and off while the large laces are spread wide for a locked-in sensation. These design elements balance style with functionality. With the variety of colorways available and different ways to string the laces, the Nike Zoom KDX is just as wearable off-court as it is during a game. Nike released various colorways of Kevin Durant’s tenth signature basketball shoe. Another celebrated colorway of the Nike KDX drops on February 15, 2018 at $150 still. This colorway celebrates Kevin Durant’s ninth appearance in the NBA All-Star Game, which happens on February 18. The shoe’s new look draws inspiration from Santa Monica, a neighborhood west downtown Los Angeles. The KDX AS’s upper is a vibrant mix of Ocean Fog, Hyper Crimson, and Fuchsia Blast, producing a unique tonal appearance that alludes to both the colors of the sun and the sea water. The thick outsole also features vibrant streaks of the three hues. The tongue and laces of these Kevin Durant basketball shoes for the All-Star Game are blue. The foam that lines the inside of the KDX AS is bathed in fuchsia, and the insole that straightforwardly references the Santa Monica neighborhood gets the crimson look. The Nike KDX ‘Aunt Pearl’ pays tribute to Durant’s aunt who passed away in 2000 because of lung cancer. The ‘Aunt Pearl’ colorway is dressed in pearl pink and is finished off with white accents. Sales proceeds of the Nike KD 10 'Aunt Pearl' will go to the Kay Yow Foundation. In January 2018, a meaningful colorway of the Nike KDX releases. It celebrates in advance February as the Black History Month. The upper is made of black FlyKnit with integrated red and green threads. The colors of the pan-African flag also figure prominently on the rear part of the midsole. The same hues adorn the predominantly black laces. The Nike KDX BHM is released on January 15, 2018 at $150. A House of Hoops exclusive, the KDX ‘Blinders’ is inspired by Durant’s ability to block out all distractions. This colorway features a black-based upper that sits on top of an all-black outsole. Durant’s number 35 is seen on the overlays. Originally a Finals PE, the Nike KD 10 ‘Celebration’ is dipped in racer blue and metallic gold. The insoles feature words and phrases from his critics with his Finals stat line superimposed on top. Limited and exclusive to the participants of Nike’s Elite Youth Basketball League, the KD 10 ‘Peach Jam’ boasts a multicolored Flyknit upper that includes shades of green, yellow, and orange. Finishing things off are Mango-colored accents landing on the Swoosh and tongue branding. To celebrate Durant’s first championship, the KDX receives a premium makeover courtesy of NikeLab. The NikeLab KD 10 features a mix of olive, cargo khaki, and white. A glow-in-the-dark outsole finishes off the silhouette.